It did not last, however. As Tiwari witnessed over the years, things gradually changed for the small village of Devchuli Municipality-17, of Nawalparasi. As time passed, rainfall became irregular and uncertain thereby converting the once burgeoning arable farmlands of the village into dry and almost barren lands. The uncertainties of rainfall increasingly turned into drought, often for prolonged period. The problem got so severe that it crippled the very base of once-flourishing agriculture sector of the village. “Rain won’t fall on time even if we cultivated our farms on time, laying waste to our time, money and efforts. Something had to be done,” said Tiwari. As stakeholders realized the obvious impact of climate change in the agriculture-dependent settlement, they scrambled for solution. They needed to find innovative ways to assimilate and try to prevent climate-induced crisis. But only few villagers hoped for finding such a solution. The much-needed solution came their way about two years ago when some NGOs collaborated with the locals to initiate a pilot project on adopting climate-smart agriculture (CSA). The NGOs, Local Initiatives for Biodiversity, Research and Development (LI-BIRD) and CGIAR; through their program on climate change, agriculture and food security (CCAFS); implemented the project in 21 villages across the country, one of which is Kuleni Rajahar of Nawalparasi. The pilot project in the village started with formation of ‘Kuleni Mixed Farmers Group’, which served as a representation of local farmers, who then collaborated with the NGOs to implement the pilot plan. The dependency on rainfall was reduced with the introduction of solar-based agriculture. It benefitted farmers by delivering better crop yields by using methods, which included precision water management, precision nutrition, no-till farming methods, among other CSA practices, and technologies that empowered the farming community. “We are making efforts to fight the dire effects of climate change and increase food security,” said Tula Ram Subedi, chairperson of the local farmers’ group. “For instance, we harnessed the power of solar energy, which would otherwise have gone wasted, to pump underground water and use it for irrigation,” he added. With the investment of Rs 2.04 million, the village has two solar-powered water pumps that can lift about 100,000 liters of water per day if there is good sunshine. It has enabled the local farmers to use solar-based irrigation system for its 6.7 hector of irrigated lands as an alternative to traditional diesel and electric pumps. Local communities contributed about 20 percent of the cost of solar pumps while the project covered the remaining costs. However, boring water is not always reliable for irrigation in the village. “If we irrigate our farms using underground water, we need good sunlight for at least three days. 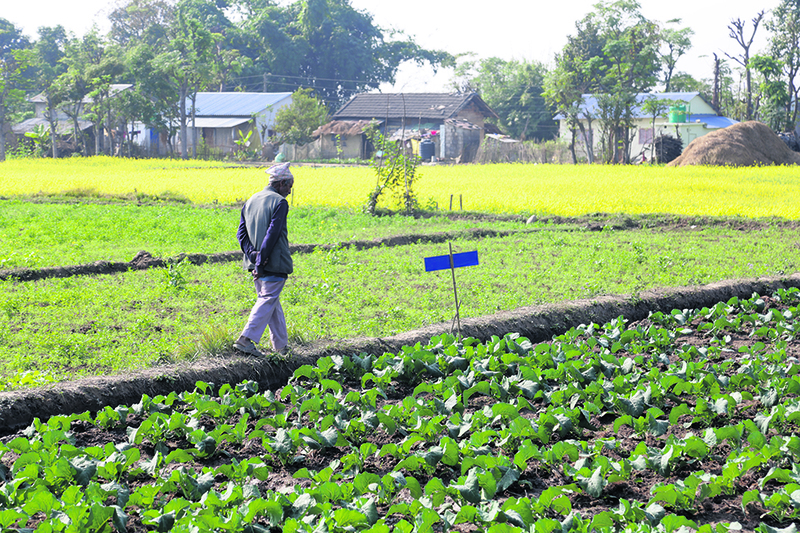 Otherwise, the dampness of the soil can kill the crops and vegetables,” said Narad Ranabhat, 60, a local farmer. Ranabhat said underground water is not as good as rainwater for irrigation. “Nonetheless, the benefits of using solar-based irrigation system are undeniable,” he added. Few other farmers also shared the same viewpoint on the matter. Under precision water management, farmers are able to utilize available water efficiently without wastage. Likewise, precision nutrition program supported by the project has enabled farmers to use the precise amount of fertilizers so that the soil’s fertility and quality of crops and vegetables are not affected. The project also recommends using government-approved dosage and types of fertilizers. Access to irrigation and knowledge on improved irrigation methods has increased the production capacity of the village’s farms. While once farming was limited to only seasonal crops like usual paddy, wheat and maize, they are now farming vegetables like potatoes, cabbage, spinach and cauliflowers among others. Agriculture sector, which contributes to about one-third of gross domestic product in Nepal, is the major source of livelihood for the village. However, Kuleni Rajar village is still largely into substantive agriculture. Despite efforts to modernize their agricultural practices, they are yet to get into commercial farming. Now survived by her extended family of nine members, Tiwari said she feels the good old days returning. “The dying agriculture practice has now been revived. Many of our problems are gradually solved. We are in a much better state now,” she said. 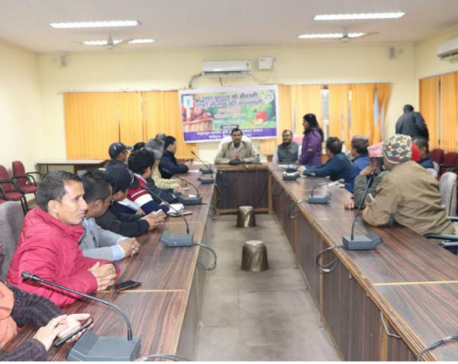 Arun Khatri Chhetri, science officer of CCAFS, said adopting public-private partnership model like the one in Kuleni Rajahar is very important to combat the impact of climate change at the local level.